Eat slowly as if it was a pleasure you desired to prolong, rather than a duty to be got rid of as quickly as possible. Don’t bring your prejudices, your dislikes, your annoyances, your past misfortunes, or future forebodings, to the table – they would spoil the best dinner. Respect the hours of the meals, you have no right to injure the temper of the cook, destroy the flavor of the viands, and the comfort of the family, by your want of punctuality. Have as much variety in your food as possible, but not many dishes served at one time. Find as little fault with the food prepared as possible, and praise whenever you can. Finally, be thankful, if you have not meat, that you have at least an appetite, and hope for something more and better in the future. 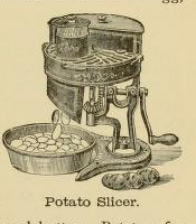 Source: Jennie June’s American cookery book, 1866.